Adobe DNG Codec for Windows 8.x Desktop, Windows 7, Windows Vista and Windows XP (all editions including 64-bit) - Adds first class Adobe DNG files support to Windows Explorer, with full metadata exposed! 64-bit and-32 bit Adobe DNG raw codec for Windows 7, Windows Vista and Windows XP SP3. Enables support for Adobe DNG raw format in Windows Explorer, Windows Photo Gallery, Windows Photo Viewer, Windows Live™ Photo Gallery and, on Windows 7, also within Windows Media Center and Media Player 12, with full 64-bit support. Our Adobe DNG codec supports raw and linear DNG files, produced either by DNG-enabled digital cameras (Samsung, Leica...) or Adobe software such as the Adobe DNG Converter or Adobe Lightroom. Additionally, the codec supports 16-bit linear files created by 3rd-party applications such as DxO Optics Pro. The codec can be configured to use the embedded preview JPEG instead of performing full raw conversions, using the supplied Control Panel applet, making DNG previewing extremely fast, comparable to normal JPEG viewing. Our DNG codec is much quicker than the current "r2" v1.1 preliminary codec available from Adobe Labs and uses far less CPU resources to operate, in addition to be fully compatible with Windows Vista as well as installable on Windows XP, to provide high quality thumbnails to all current Intel and AMD desktop Windows versions and editions. 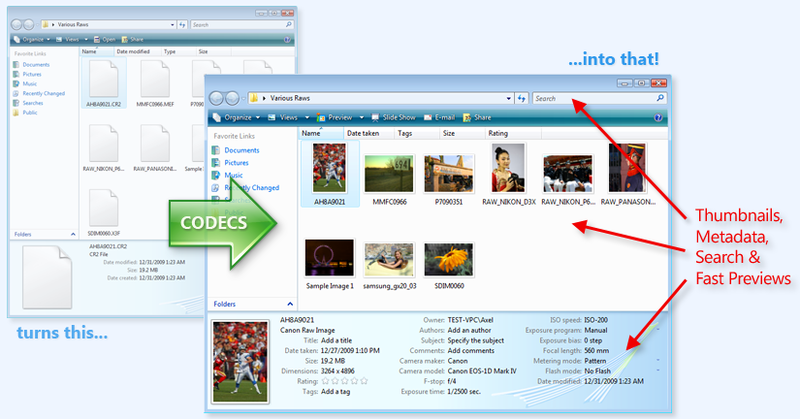 Integration with Windows Search let Windows Vista and Windows 7 users locate DNG files instantly from any Explorer search box: find files on Title, Author, Keywords/Tags etc. directly within Windows Explorer!